Here are eleven ways to dress up your beehive, from easy — swap out the wooden handles for some interesting, decorative hardware — to more difficult projects including shingles, observation windows, and webcams. The choices are nearly endless. A home design center or big-box hardware store is a good place to start looking. Also consider looking at marine supply stores, as they have a good selection of heavy-duty, weatherproof hardware. Decide first whether you’re partial to the old-fashioned antique look (in which case a home design center would be a good bet) or the sleek and modern look (stainless steel nautical hardware may fit the bill). Don’t favor design over safety. Make sure the handles you choose are up to the task. 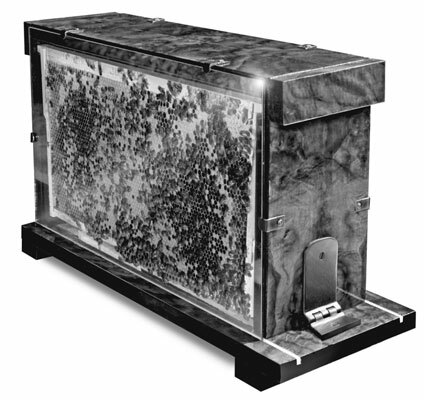 The handles on a fully loaded super or hive body have to be able to lift between 50 and 90 pounds. 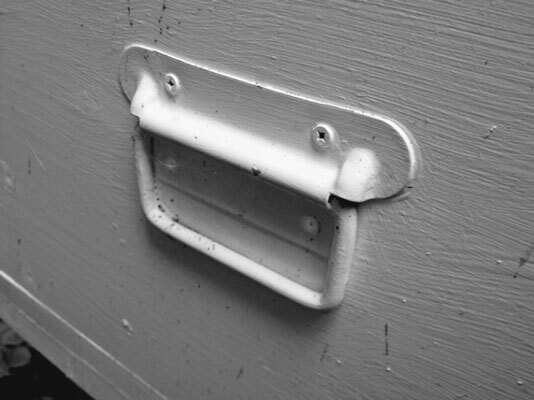 Affix handles with at least four heavy-duty screws. 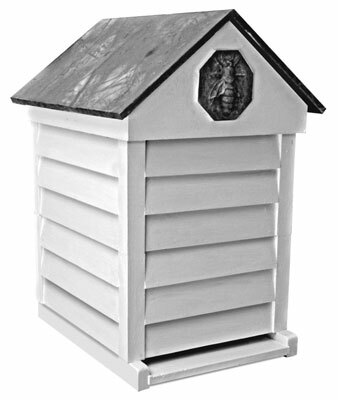 These heavy-duty flush-mount chest handles provide an excellent grip for lifting hives. A metal frame rest isn’t so much decorative as it is practical. Wooden frame rests take a bit of a beating as you pry frames apart and scrape off burr comb and propolis during hive inspections. Over time, the soft wood gets chewed up pretty badly, and sliding frames along the frame rests becomes more difficult. 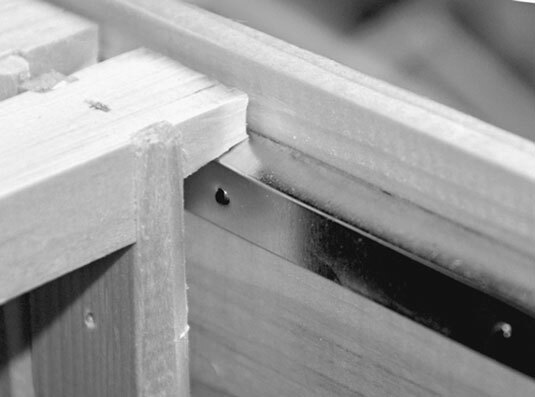 The solution is to tack a narrow strip of aluminum flashing over your wooden frame rests. The metal lasts a long time, makes removing propolis easier, and protects the frame rests from getting nicked up. Do this as a final step when you’re assembling your hive bodies and supers. Adding a narrow strip of aluminum flashing along the frame rests makes it easier to manipulate frames and slide them into place. Quite honestly, given the cost of some woods, this may not be all that practical for day-to-day beekeeping, but wouldn’t a custom-made curly maple nuc make a wonderful gift for that special beekeeper in your life? Or how about a cherry wood frame jig to present to the outgoing president of your bee club? Consider the observation hive. It’s intended to be viewed and admired like a piece of fine furniture. Just have fun and experiment. You surely won’t paint over any wood that’s so beautiful and expensive, so be certain to protect your investment by applying a few coats of quality exterior polyurethane or marine varnish. Apply this after you have assembled the woodenware. This observation hive was veneered using book-matched European burl walnut, coated with a half dozen coats of high-gloss polyurethane. 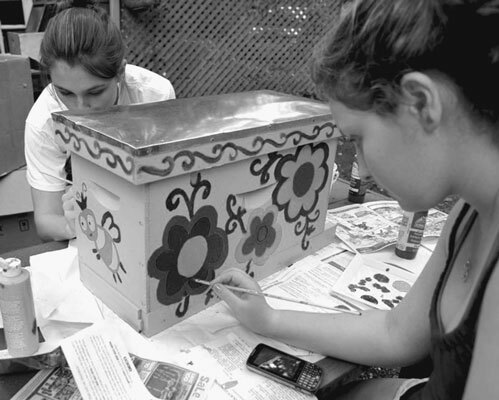 People love to paint their mailboxes in creative ways, so why not their beehives? Whimsical, romantic, or abstract, there are no rules here. Just do whatever tickles your fancy. You can use any kind of exterior grade latex or oil paint. Apply your designs after assembling the woodenware. Marina Marchese’s assistants Taylor Gillespie (left) and Rachel Williams (right) putting the finishing touches on an assembled nuc hive. Here’s a fun way to make your hive look like a little cottage: After you assemble your hive bodies and supers, clad the outer sides of your hive bodies with shake shingles or traditional beveled lap siding. Attach using 1/8 inch galvanized nails. When you do this, you don’t even need handles on the hive, as the lip of the siding creates a finger grip on all the hive’s outer sides. Be generous with the nails (every 2 inches). 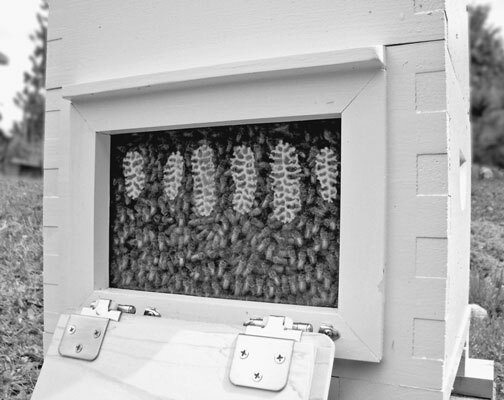 Lap siding was used to create the hive shown. For fun, you can paint the hive to match the colors of your house. There you have it: a cozy cottage for your beloved bees. Lap siding on standard Langstroth hive bodies. In Italy, most of the beehives have a little roof just above the hive’s entry. A front porch. There’s no reason not to add this little architectural embellishment to any hive. It may even be something that your bees do appreciate (after all, those guard bees may be grateful to get out of the rain). Add the porch after you assemble the hive body. Use a couple of 11/4 inch deck screws to affix the porch assembly to the front of the hive. A simple front porch adds some whimsy to your hives. In place of the plywood insert on your inner cover or crown board, use a sheet of 1/8-inch thick Plexiglas, cut to the same specified dimensions as the plywood. This way, all you need to do to have a peek at your bees is remove the outer cover. Instant observation hive! When making your inner cover, substitute a sheet of 1/4 inch thick Plexiglas for the plywood. You can make almost any hive into an observation hive by cutting a window into a side of the hive body. 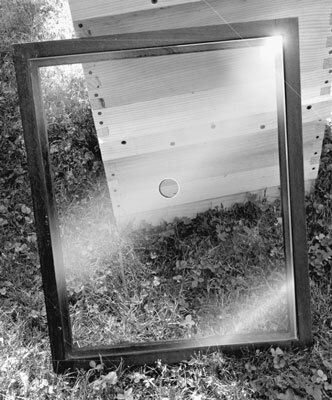 You’ll need to insert a glass or Plexiglas window and a hinged or removal panel (for the bees’ privacy and to insulate the hive when you’re not observing). The size of the window is up to you — it’s more of an aesthetic decision than anything else. The lovely Warré observation hive in the figure was built by the House of Bees in Southworth, Washington. An observation Warré hive from the House of Bees. Many beehive plans specify aluminum flashing for a roof material. Using copper flashing (instead of aluminum) results in a beautiful blue patina over time (like the Statue of Liberty). You apply copper flashing the same way as the aluminum flashing. Alternatively, for hives with a peak roof, such as the Kenya top bar hive or the Warré hive, you can use conventional asphalt roof shingles or even cedar shake roofing. In these cases, use 7/8 inch roofing nails to attach the shingles or shakes to the roof. If the hive design specifies a flat roof, you can swap out these tops for a peaked roof. 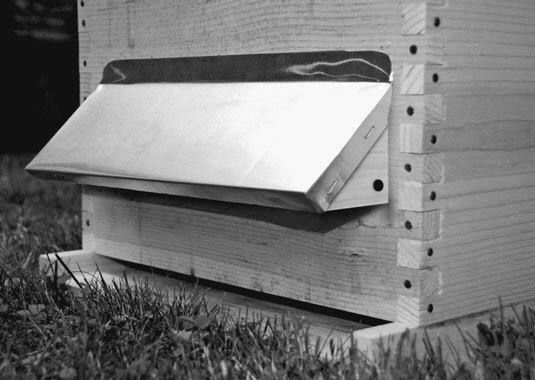 Use the construction plans for the latter hives and simply adjust the measurement to accommodate your nuc, Langstroth, or British National hive. Just make sure the outer dimensions of the top (the part that sits on the hive) are the same as prescribed in the plans (so the roof can sit on the hive like a hat sits on a head). Okay, you’re at work or on vacation and you miss your girls. But technology has provided a way to visit your bees from afar. For around $100, you can get a weatherproof, wireless webcam and mount it near your hive’s entrance. By logging on to the web, you can see what your bees are up to in real time. How cool is that? Make sure your hive and wireless camera are close enough to the house to pick up your wireless signal. Also, you need to run an electrical line to power the webcam (if you need help, consult the basic instructions that accompany your webcam).